A fragment of a single strand of DNA, built of the nucleobases cytosine and guanine, can be imprinted in a polymer—this has been shown by chemists from Warsaw, Denton and Milan. The resulting artificial negative, with a record-long length, functions chemically like a normal strand of deoxyribonucleic acid. This achievement finally confirms the possibility of creating polymer imprints of DNA, functionally corresponding to DNA fragments containing all four nucleobases. A year and a half ago, a Polish-American-Italian group of researchers created a chemical DNA negative by means of molecular imprinting. Molecular cavities, generated in a carefully designed polymer, behaved chemically just like a real DNA strand (complementary to the one used for imprinting). The first oligomer « imprinted » in the polymer was short, consisting only of six adenine and thymine nucleobases forming the TATAAA sequence. Currently, a group from the Institute of Physical Chemistry of the Polish Academy of Sciences (IPC PAS) in Warsaw, headed by Professor Wlodzimierz Kutner and cooperating with the University of North Texas in Denton (USA) and the University of Milan (Italy), has taken the next step. In the journal ACS Applied Materials & Interfaces, the researchers have presented the process of constructing a negative fragment of a single strand of DNA containing the other nucleobases: cytosine and guanine. « The oligonucleotide now imprinted in the polymer is slightly longer than that described in our previous publication. However, this was not about breaking records. Most importantly, it was to show that the molecular imprinting method can be used to build stable negatives of oligonucleotides containing all of the nucleobases in deoxyribonucleic acid, » says Prof. Kutner. Each DNA molecule is a ribbon twisted into a helix, made of two long, permanently connected strands. A single strand consists of nucleotides with multiple repetitions, each of which contains one of the nucleobases: adenine (A), guanine (G), cytosine (C) or thymine (T). Since the adenine present on one strand is complementary to thymine on the other, and guanine to cytosine, on the basis of a single strand of DNA it is easy to reconstruct its complementary partner. This mechanism not only increases the permanence of the record of the genetic code, but also allows it to be transcribed from DNA to RNA in the process of transcription, which is the first stage of protein synthesis. « DNA molecules are very long; if they were to be straightened out, they would have a length measured in centimetres. Under normal conditions, the double-stranded DNA is, however, twisted and coiled in various ways. The imprinting of such a spatially complicated structure in the polymer is not only impossible, but also does not make sense, because different molecules of the same DNA can be twisted in different ways. Therefore, as a rule, during double-stranded DNA testing, its strands are first separated, and then cut into fragments containing from several to several dozen nucleotides. 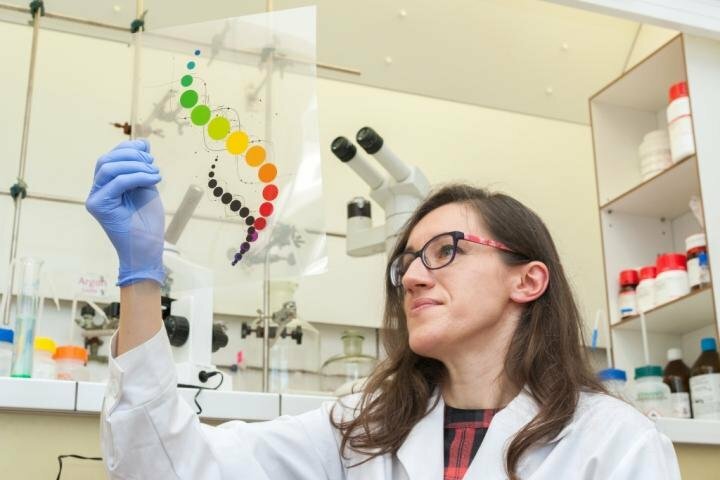 It is then possible to attempt to imprint these fragments of this length in the polymer, » explains Dr. Agnieszka Pietrzyk-Le (IPC PAS). In order to imprint the molecules in the polymer, they are introduced into a solution of monomers, or « building blocks, » from which the future polymer is to be formed. Some of the monomers are selected so as to self-assemble themselves around the molecules being imprinted. The mixture is then electrochemically polymerized. This electropolymerization results in a thin, hardened film of a polymer, from which the imprinted molecules are then extracted. In this way, a polymer is obtained with molecular cavities matching the original molecules not only in size and shape, but even their local chemical properties. « In our latest research, we have shown that it is possible to imprint into the polymer the GCGGCGGC oligonucleotide, i.e. one that contains eight nucleobases. This oligomer is genetically significant. Its presence, among others, increases the probability of neurodegenerative diseases, » explains Ph.D. student Katarzyna Bartold (IPC PAS). The first polymer negative, with an imprinted adenine-thymine oligomer, was fully selective, that is only the TATAAA molecules previously used to prepare the polymer could enter the molecular cavities. In the currently synthesized polymer, the guanine-cytosine cavities are also highly selective, but this selectivity still leaves much to be desired. If the oligonucleotide captured from the solution differs only by one base from the GCGGCGGC oligonucleotide used for imprinting, the cavity may not notice this difference. Researchers attribute this behaviour to bonds between guanine and cytosine stronger than those between adenine and thymine. « Interestingly, in some respects our DNA negative appears to have better properties than those of the natural DNA strand. The true DNA strand has nucleotide cores that are electrically negatively charged, which makes the molecules repel each other in solution. Chemists must therefore neutralize this charge by, for example, introducing positive sodium ions. Our molecular cavities are already electrically neutral. Therefore, using our polymer DNA analogue, we eliminate one stage of the research: neutralization, » notes Dr. Pietrzyk-Le. In the near future, researchers intend to refine the developed technique, imprinting ever longer fragments of DNA, so that oligonucleotides consisting of at least a dozen or so nucleotides can be mapped. Polymer films with such long molecular cavities would enable constructing effective detectors of genetically important DNA fragments. This would be possible since the mass of the polymer with cavities filled with oligomers captured from the test solution increases, the electrical conductivity of the polymer also changes, and changes in these parameters can be easily detected. In the future, another application would also be possible. Polymer films with imprinted DNA fragments and molecular cavities filled with these fragments will be able to be used to study new drugs targeted at genetic diseases.